How gains from early childhood experiences are initiated, increased, sustained, and affect life-course development are fundamental to science and society. They also have increasing policy relevance, given public investments in early learning programs and the need to measure their effectiveness in promoting well-being. 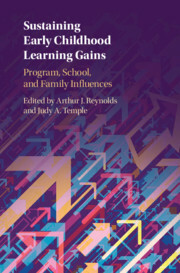 With contributions from leading researchers across many disciplines, this book emphasizes key interventions and practices over the first decade of life and the elements and strategies through which gains can be enhanced by schools, families, communities, and public institutions. Three critical themes are addressed: firstly, the importance of documenting and understanding the impact of investments in early childhood and school-age years. Secondly, increased priority on elements and principles for scaling effective programs and practices to benefit all children. Thirdly, a focus on multiple levels of strategies for sustaining gains and promoting long-term effects, ranging from early care and family engagement to school reform, state, and federal policy. 5 - What Can We Learn from State-of-the-Art Early Childhood Education Programs?